Two weeks removed from an impressive run in the Central Mass. 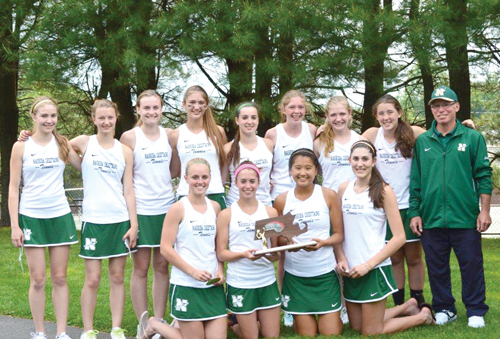 Division 1 Tournament, it can be said, without hesitation, that life was good for Nashoba Regional’s hard-working girls’ tennis team this spring. The Chieftains ended the regular season with a solid 11-5 record. Nashoba followed this up with three victories in the post-season, two coming against higher seeds. Fourth-seeded Shrewsbury, the defending champion, ended the Chieftains’ season with a 3-2 victory in the Central Mass. Division 1 final at St. John’s High School. The Colonials would later advance to the state final, where they were beaten by Andover, 3-2. The Chieftains were at their best when they clashed with Shrewsbury in the Central Mass. final. Nashoba, which lost two matches to the Colonials during the regular season, grabbed a quick 2-0 lead thanks to sensational play in singles. Third singles hitter Emma Picaro, a sophomore, gave the Chieftains a 1-0 lead when she knocked off Abby Scott, 6-0, 6-1. Second singles hitter Kelly Poole, a junior, followed this with a 6-2, 6-0 win over Micaela Stowe. Shrewsbury scored its first point when its number one doubles team of Radheka Duvvuri and Sonali Razdan topped senior captain VIctoria Wang and junior Sophia Duros, 6-1, 6-0. Shrewsbury tied the match, 2-2, with a closer-than-it-looks win at first singles. The Colonials’ Jessica Perkins, a four-time Central Mass. Individual Singles champion who fell in the state final last Saturday, edged sophomore Jillian Winer, 6-2, 6-1. Despite the score, the match was much closer than one would think. Winer, a captain and Midland Wachusett League all-star, kept the more experienced Perkins on her toes from start to finish, resulting in many long volleys. Both players scored difficult points and both launched a variety of tough shots at the net on the base-line. Perkins’ match-tying victory made the duel at second doubles all the more dramatic. Nashoba’s tandem of sophomore Kyra Fasano and junior Erika Rohrberg battled gamely, but came up just short, losing to Celine Mende and Surabhi Godbole, 6-4, 6-3. The triumph improved Mende-Godbole’s record to 17-1. Mende-Godbole, a first-year team, had their hands full whacking shots against Fasano-Rohrberg. They took the comeback route in securing their final point, rallying from love-40 to force deuce and eventually win. The Chieftains went into the final on a high after knocking off second-seeded St. Peter-Marian, 3-2, in a semifinal. Nashoba started fast, winning both doubles matches. Wang and Duros defeated Veronica Sweeney and Kristina Domantas, 6-1, 6-2, while Fasano and Rohrberg blanked Marlena Osowoski and Morgan Proko, 6-0, 6-0. A big win by Winer at first singles clinched the outcome. Winer was down both a set and 2-0, but rallied to defeat Paige Benoit, 3-6, 6-2, 6-3. Nashoba kicked off the post-season with a 5-0 first round win over 11th-seeded Leominster and a 3-2 success over third-seeded Wachusett Regional in a quarterfinal. The locals defeated the powerful Mountaineers three times this year. “We subscribed to the motto “Why Not Us” and we used it all through our post-season run,” coach Winer said. As noted by coach Winer, the Chieftains’ season contained a surprise or two. Nashoba started the year with three straight losses (back-to-back one point defeats against Westboro and Shrewsbury, and a 4-1 setback to Westboro, both tournament-bound teams). The Chieftains stopped the losing streak with a 3-2 victory over Notre Dame Academy. Notre Dame went on to win the Central Mass. Division 3 championship. The Notre Dame victory marked the beginning of an eight-match winning streak for the Chieftains. Nashoba should be strong next season. The top three singles players return while Wang is the only player to graduate from the doubles teams. Other players who contributed this season include sophomore Cayla Murphy, sophomore Larissa Plishevsky, sophomore Emily Floyd, freshman Kara Mannion and freshman Meredith Curran.